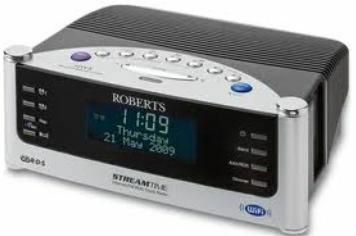 Roberts Streamtime review | What Hi-Fi? Internet radios come in all shapes and sizes. They range from the ruggedised kitchen/bathroom special Revo Pico RadioStation to the iPod docking models available on the shelves, but the Streamtime is – well, a bedroom clock/radio. And that means it comes complete with what Roberts calls a Humane Waking System, or in other words a range of alarms for daily, weekdays, weekends and so on. Oh, and perhaps with an eye to its target market, a ‘nap timer', too. What it also means, but shouldn't have to, is that this is by far the most lightweight and plasticky offering we've seen in a while, complete with fake pillars either side of the fascia – the real feet are hidden away underneath – and very so-so buttons and display. Reception extends to internet radio and FM, but surprisingly no DAB. What's more, despite being equipped with an obvious wi-fi antenna – a low-rent grey plastic affair – it took rather a lot of coaxing before it found our home network, and the system for inputting security keys is laborious. All of which would be forgiven if the Streamtime had a superb sound, making it a bargain at the price. Unfortunately it sounds thin and chesty, weedy in the bass, and soft and uninvolving further up the frequency range. It's really rather unimpressive all round.